Syrian hamsters are the ancestor of many of the dwarf varieties and other varieties kept as pets today. The original Syrian, also known as the teddy bear or golden hamster, is a pet with a diverse diet and some interesting food habits. When shopping for your hamster's supplies, you'll likely come across a variety of premade and packaged meal formulas for hamsters. Most all of these will have claims such as "Complete," "Balanced" or similar, making the decision a hard one. Some kibble formulas are brightly colored with different shapes and ingredients in them, which may seem appropriate because it offers variety. While the variety may certainly be healthy in some of these, many of these are simply artificial dyes and other such ingredients. When choosing a kibble for your hamster, look for one that's low in seeds and doesn't contain extra sugars. While teddy bear hamsters aren't prone to diabetes like their dwarf relatives, these ingredients can still cause obesity and other problems. The plain-looking green pellets are generally ideal for small rodents such as Syrians. Like other rodents, hamsters thoroughly enjoy chewing on something crunchy. Many vegetables are healthy treats that provide a crunch. Carrots, green peppers and celery are prime examples. Syrian hamsters will also enjoy -- and benefit from -- brightly colored vegetables such as romaine lettuce, spinach, broccoli or red peppers, among other tasty veggies. Supplement kibble or pellets with a few treats of fresh vegetables. Fruits, especially apple slices, are another vitamin-rich treat your teddy bear hamster will relish. Only give a piece or two of fresh fruits or veggies daily. An example would be an apple slice or a leaf or two of spinach. Whole grains, ideal treats for a hungry hamster, will be either eaten immediately or hoarded in his cheeks for a later time. Unsweetened whole-grain cereals, whole wheat toast, cooked and cooled brown rice, and similar foods are favored treats to most Syrian hamsters; they also welcome sunflower seeds and nuts without hesitation. Small amounts of grains, seeds and nuts are a good treat on a weekly -- or every three to four days -- basis. They can be fatty, so overfeeding these tasty treats could lead to health problems. One side of crust of whole-wheat toast, one or two almonds, or about one-eighth to one-quarter teaspoon of seeds should suffice and not lead to an obese hamster. 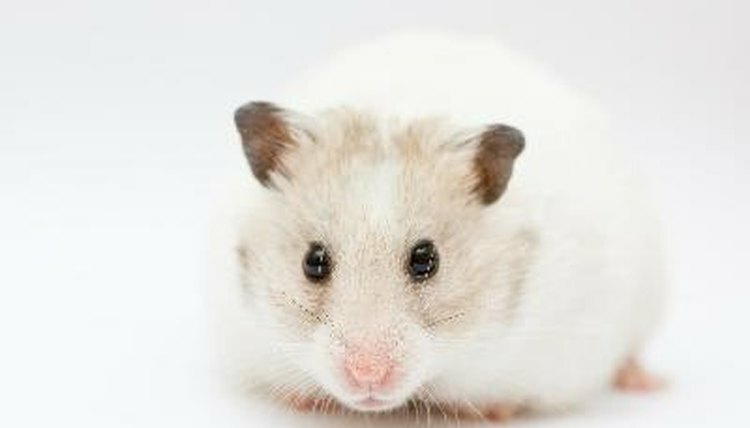 The word "hamster" is derived from the German "hamstern," a word meaning "hoard." They get this name because they stuff their cheek pouches with food, hoarding it until they feel the need for an additional snack. They may empty their cheeks in a specific corner of their cages, so watch out for small stashes when cleaning or feeding. They don't require much food; a tablespoon of their kibble or pellets per day plus a few bits of fresh veggies and fruits will suffice. Place something to gnaw on in their cage once a week. Unsprayed fruit tree branches and twigs are ideal. A plain dog biscuit will also work.